This hamburger soup is an easy and delicious meal full of veggies. I love that it fills bellies and gives us the nutrition we need to stay healthy during the cold season. Get on the family about good hand wishing. This means using soap, warm water and thoroughly scrubbing our hands as needed. Go through the medicine cabinet and throw away all expired cold medicines. 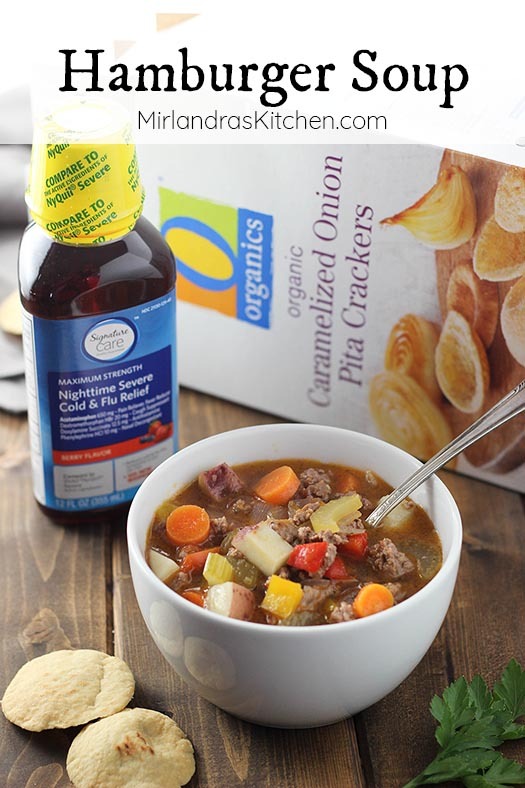 Head to Albertsons and make sure I’ve got my favorite Signature Care™ cold and flu products on hand. (I love the berry flavor Nighttime Severe Cold & Flu Relief – it actually tastes good!) Having what I need on hand helps to prevent late night store runs with a sick kid! Signature Care products provide the same quality and relief that national name brands do, but at a better value. Signature Care products contain the same active ingredients & are subject to the same manufacturing standards mandated by the FDA as national brands. Stock the pantry with crackers, cream of wheat, canned soups, broth, juices, ginger ale and good soup making supplies. Make and freeze pints of our favorite soups. Along with my fall checklist I do a few other sensible things to keep us healthy. I make sensible nutritious meals to keep our bodies in fighting condition. The immune system needs basic building blocks to function including specific amino acids only found in meat. I make sure we get protein and veggies to give our bodies the best chance of staying well. As family we make it a priority to use high quality ingredients and make most of our dinners healthy. But the family rule is that dinner still has to taste great! Every time I’ve used O Organics® grass fed ground beef I have been impressed with the quality. When you open the package it smells fresh and looks delicious. I also like that the meat is raised without antibiotics or added hormones. 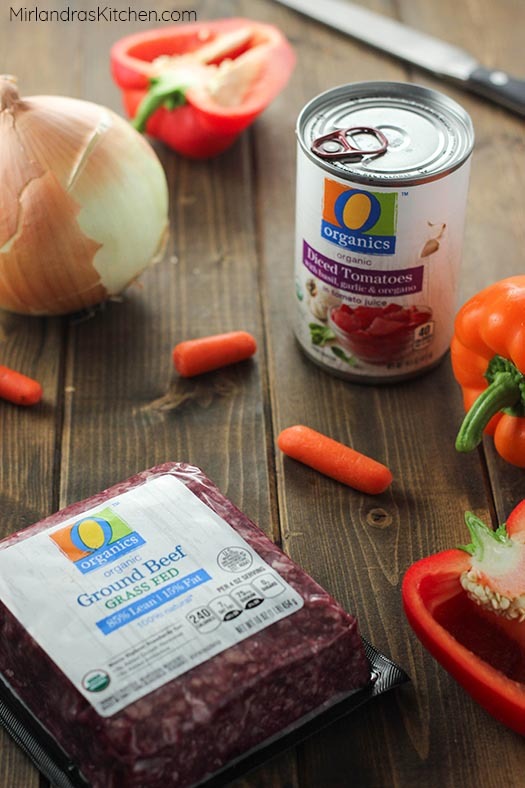 When I bring home O Organics® ground beef I feel confident that I’m feeding my family something wholesome. I appreciate that the price fits within my budget! It is nice that Albertsons believes that good quality food should be available at a good price! In recent weeks I have been working on the finishing touches for my new cook book, Simply Delicious. I’m having a blast but the scope of the project has been taking up a lot of my mental resources so I’ve been unusually scattered. I don’t even want to tell you how many times I forgot to thaw something or totally torpedoed my meal plan for the week! Thankfully our closest Albertsons is less than a mile away and I’ve been popping in a lot to let their amazing staff help. One of the things I love about Albertsons is the depth of knowledge each of their employees has. If I have questions about the produce quality and ripeness, their people have answers. I’ve even had them come over and check on me when I can’t make up my mind about dinner. Somehow they notice I look conflicted and are ready with a kind suggestion or solution. We go there so much we have some favorite checkers who take the time to visit with us and make us smile. Extra help and genuine kindness is always nice but I have appreciated it just a bit more during the recent craziness. O Organics and Signature Care™ products are available in my area exclusively at Albertsons but they can also be found in the entire Albertsons family of stores. I shop at Albertsons here in Boise and at Safeway when I’m in Oregon visiting my family. In your area the stores may be under one of these names: ACME Markets, Jewel-Osco, Vons, Pavilions, Randalls, Tom Thumb, Shaw’s, Star Market, United Express, United and Carrs/Safeway. You can visit Albertsons.com to find a store near you and to get more great recipes like this. Stay healthy this winter!!! Thanks for stopping by to cook with me! Tools In This Post: One of my almost daily dinner tricks is to use this handy tool for dicing. Onions, tomatoes, bell pepper, jalapeno peppers – they all come out evenly and perfectly sized in a snap. The tool rinses out easily and I save a ton of time cutting up food for meals like soup, salsa and stir fry. If you cook much, this is a worthwhile investment. Nothing goes with soup as well a fresh rolls! 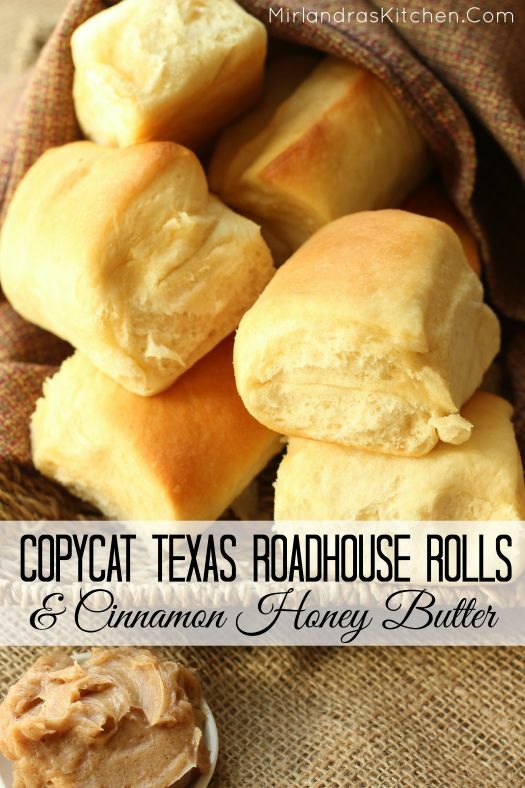 These dinner rolls are delicious and ridiculously easy. 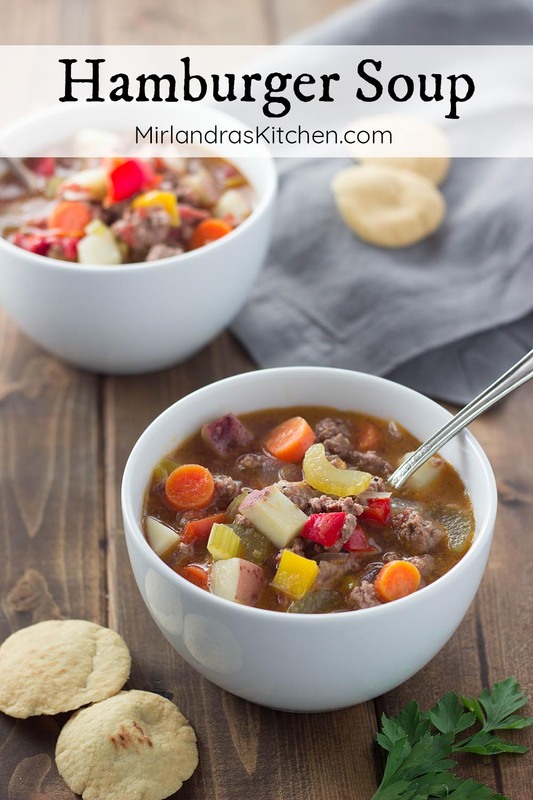 This hamburger soup is an easy and delicious meal full of veggies. I love that it fills bellies and gives us the nutrition we need to stay healthy during the cold season. Sprinkle on some cheese and watch the soup disappear! In a large pot over medium-high heat, brown the hamburger. Strain the fat and juices from the meat and put back in the pot for cooking. Set the browned hamburger aside in a bowl and cover to prevent drying. Add the onion, celery, and bell pepper to the meat juices and cook over medium-high heat for several minutes until they start to soften. Add everything else to the pot except the cooked hamburger. Stir to combine, and bring to a boil. Reduce the heat to medium and cover the pot. Maintain a simmer for 20 minutes. Add the hamburger and check the potatoes / carrots - these veggies are done when they are tender and almost firm but not mushy. Continue to simmer until the potatoes and carrots are done. Taste the soup and add any additional salt or pepper if desired. Serve with grated Parmesan or mozzarella cheese and crackers, crusty French bread or rolls. I’m going to have to try this one! I don’t make a lot of beef based soups, though, so I’m curious: is there an advantage to using water and beef boullion instead of beef broth? There are a few possible answers to this question. I think the first is personal preference. Most store beef broth does not have the flavor I’m looking for. I find it is lacking in seasoning or zip. Sometimes I even think it detracts from the food instead of adding to it. I also think it is more expensive to buy and takes a lot of room to store. I have several brands of bouillon that I think have excellent flavor and do a good job rounding out what you are making. I actually use them in a lot of different ways – for instance if I’m boiling broccoli I will put beef or chicken bouillon in the water instead of salt! The taste is amazing and more appealing to meat eaters than the normal boiled broccoli. In soups I find that a little bouillon gives a great flavor base to work with. But again, this is such a personal preference. It is something I suggest people try both ways. You will probably find you have a strong preference for one or the other.